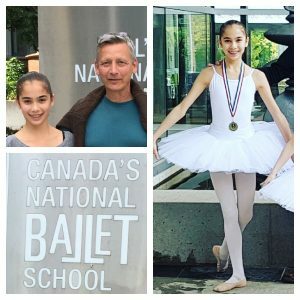 Canada’s National Ballet School invites FVAD student Isabella to full-time training in their internationally-renowned professional program in Toronto. At 13, Isabella is one of the very few students accepted each year into the internationally-renowned professional program at NBS. Living in residence, she will complete her academics at their school while continuing towards a career as a professional dancer. She joins the growing list of FVAD students who have accepted invitations to attend professional programs at company schools and colleges, including Canada’s National Ballet School, Royal Winnipeg Ballet School, School of Alberta Ballet, Randolph Academy, and the Rambert School. Learn more about our students’ audition success.